Home » » Foreign service or family service? loyalists of the ruling party, the Sunday Times has found. This extraordinary rise in nepotism and political favouritism has spawned conspiracy theories with several popular websites stating that the Government intends to dismantle the Sri Lanka Foreign Service (SLFS) altogether. Alarmingly, several key missions around the world—including Washington, The Hague, Ankara, Frankfurt and Pretoria—at present have no professional diplomatic officers at all. Sri Lanka has 62 diplomatic representations abroad, comprising consular and mission posts in 48 countries. 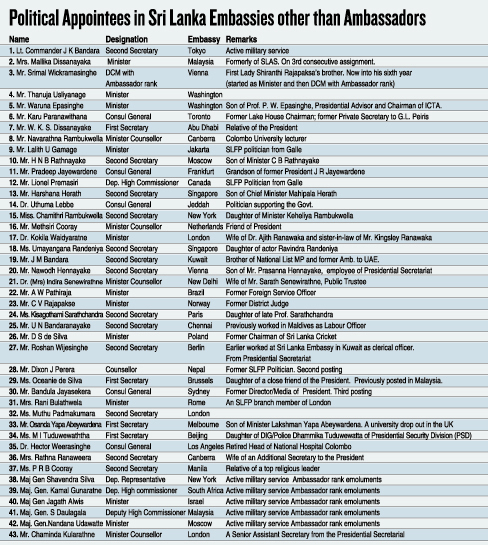 Of these, 35 Heads of Mission or Heads of Post slots have gone to non-SLFS political appointees. Of the remaining 27, three are occupied by officials of the Department of Commerce. In some of the most sensitive capitals, such as New York, Tel Aviv, Moscow, Rome, London, Pretoria and Brasilia, both Head of Mission and Deputy Chief of Mission are political appointees. 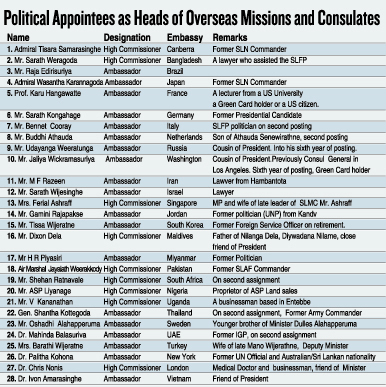 Speculation at the Foreign Office in Colombo is that several young ‘CHOGM Consultants’ are to be assigned diplomatic posts. Some of them have “told people” that they are already in possessions of letters of appointment. Although it is not known which of them have been selected, the group of 12 also includes UNP MP Rosy Senanayake’s daughter, Thisakya, and a female relative of Sajin de Vass Gunawardena who is Monitoring MP to the Ministry of External Affairs (MEA). “I don’t mean to say that career diplomats have all the wisdom and non-career diplomats are useless,” he stressed. “There have been very good and effective non-career diplomats.” These were men and women of outstanding stature, capacity and integrity who were always supported by hardworking, brilliant, credible juniors from the career service. This source pointed out that the country was also inadequately represented in London. By coincidence, the US is a key mover of resolutions against Sri Lanka at the UN Human Rights Council while Britain, a newly elected member, has taken an even stronger position. Today, more than ever, loyalists are being rewarded with plum postings to overseas missions regardless of whether or not they can deliver. As with junior entrants, there is no testing procedure. They merely require Cabinet approval and, where top level appointments are concerned, the rubber stamp of the Parliamentary High Posts Committee. Paradoxically, the MEA also continues to hold the open competitive exam for recruitment to Grade III of the Sri Lanka Foreign Service. The last batch of 25 joined in August 2013. The closing date for the next exam has been gazetted as January 31, 2014. But MEA insiders say political appointees and SLFS recruits are not treated equally. To sit the open competitive exam, a candidate must first possess a degree in any discipline from universities recognised by the University Grants Commission. The exam has two papers in world affairs. Aspirants are also tested on the political, social, cultural and economic issues of Sri Lanka, matters of current national and international interest, English knowledge, essay writing and IQ. efficiency bar exams, among other things. Before reaching 10 years in the service and moving to Grade II, officers must acquire post-graduate qualifications. INSIGHT learnt that in some missions, career service diplomats are often not included in the internal decision-making processes or their advice and inputs are deliberately discounted. “This is because professional advice is sometimes unpalatable to or hurts the personal interest of politically-appointed Heads of Mission and senior officers who want to drag the country and its people towards a self-constructed, predetermined agenda,” a source commented. In addition to all this, many non-diplomatic or clerical level positions have been given to friends and relatives in important missions such as Washington DC, Moscow, London, Geneva and Rome, authoritative sources said. More deserving public service management assistants have been sidelined. There has also been a longstanding effort to amalgamate the Sri Lanka Administrative Service (SLAS) with the SLFS. After the SLFS Association fought back, it was agreed in 2006 that there would be only five SLAS officers in overseas missions at any given time. MEA sources said, however, that there are now seven such officers serving in missions abroad and several more in the ministry. The SLFSA has been cowed into silence. Retired career service diplomat, one-time ambassador in Washington and Beijing and a former UN Under-Secretary-General, Jayantha Dhanapala is deeply critical of the situation. “From time immemorial”, he said, “the management of foreign relations of States has been entrusted to professional diplomats who are separately recruited through competitive examinations, trained in specialised subjects and skills and deployed in diplomatic missions abroad and their foreign ministries to serve the country”. This practice is widely adopted across the political and geographical spectrum in the world—from Cuba and China, on the one hand, to democracies like India, South Africa, Egypt, Brazil and Western countries. “The current regime in Sri Lanka has chosen to ignore this fundamental tenet of good governance in the flagrant undermining of institutions that is going on in our country in another manifestation of the prevailing corruption,” he asserted.Cronies and relatives of politicians in power have not only been appointed as heads of diplomatic missions but also occupy lower level diplomatic positions, Mr. Dhanapala said. Some embassies and high commissions are entirely staffed by political appointees with no knowledge of diplomatic practices, international law or even the basic rules of office procedure and accounting of public funds. Appointments are also made for short periods of two years so that more such favours can be dispensed more frequently unmindful of the huge financial burden in transporting the appointees, their families and their baggage. “Faced with huge foreign policy challenges, of which the Human Rights Council sessions in Geneva are but the tip of the iceberg, we should be investing more time and effort to professionalise our diplomatic service to serve our permanent national interests and not the transitory interests of a ruling regime,” Mr. Dhanapala warned. The Ministry of External Affairs had little say in these appointments – almost the entirety of them came from the Presidential Secretariat that largely manages the Ministry’s internal affairs. The Minister showed no resistance to this complete reversal of what has long been a 60-40 ratio i.e. 60 per cent career officers to 40 per cent political appointees serving in Sri Lankan missions overseas.